Dr. Digi's House of Stamps' new image, Beach Bum Bob, has finally reached the age of retirement! 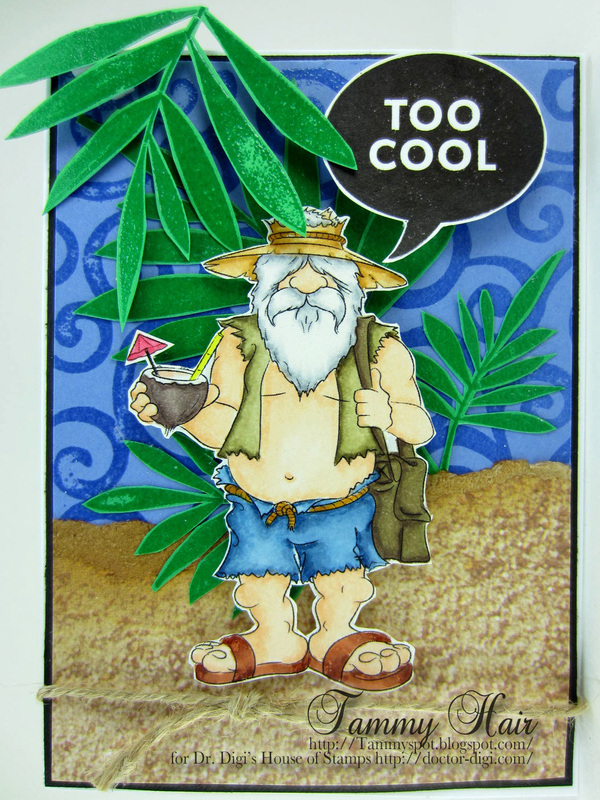 To celebrate, Bob hopped a plane to a far off tropical paradise in search of young ladies. Unfortunately, for Bob, all the young ladies think that Bob is really Santa incognito and therefore not only off limits but way to old! On the other hand, the little old ladies with purple hair love him! Last seen, Bob was boarding a jet and heading home! 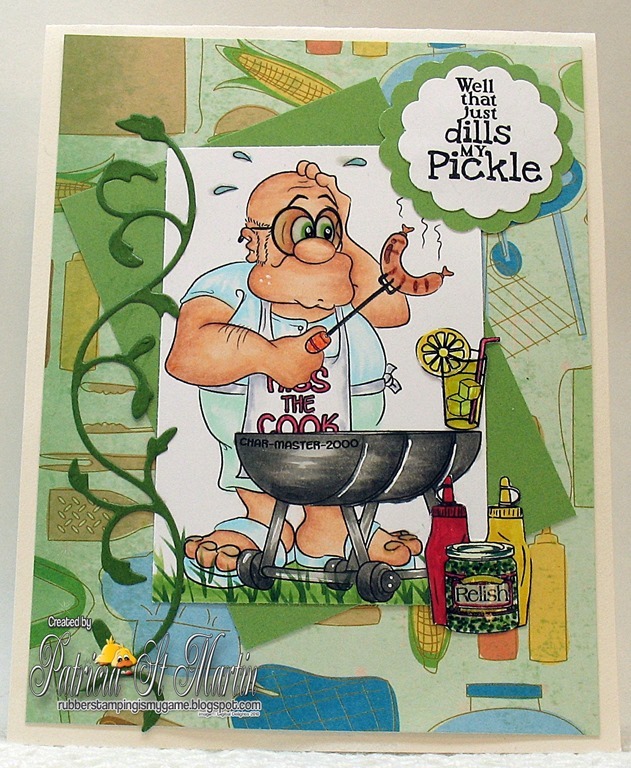 cooking up a storm with this fab card using BBQ Bill. I.T. Ian to the Rescue! How did computers go from something I wasn't interested in to something I can't live without in less than 20 years. There's nothing quite like the panic induced when the dreaded blue screen of death appears at the worst moment possible, or the broadband suddenly dies and you are faced with how long you should leave it before you decide to do battle with a call centre based far, far away! Everyone needs an IT Ian, he has been around since pong tennis first hit our screens (my kids laugh when I describe the happiness I felt when we got such a sophisticated game, let's face it, it was no World of Warcraft!). You can find I.T. Ian HERE and this month's freebie is Ian's trusty computer, available HERE. And thank you to my son for letting me take a picture of his NASA control centre as a background. Apparently he does need three monitors! 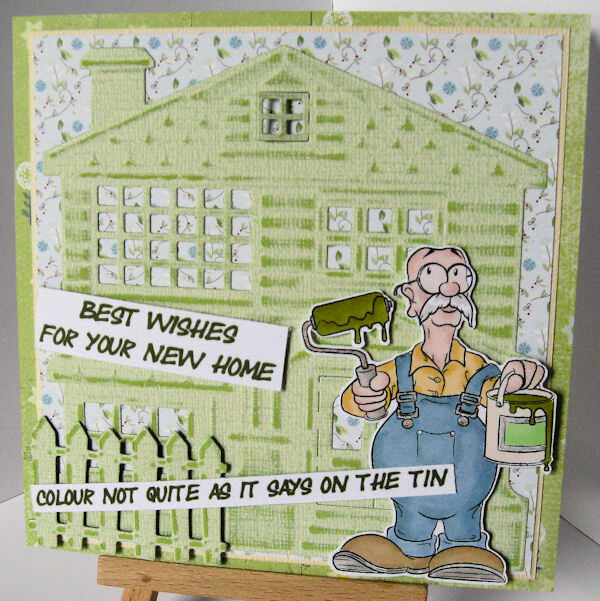 Dunderton Decorators Ltd and mad a great card, see how it's done.. Even though Flossy can't speak she can certainly make a banner to wish you a Happy Birthday! And here she is! You can find Flossy in the store for £1 - ewe won't find a better baaargain! 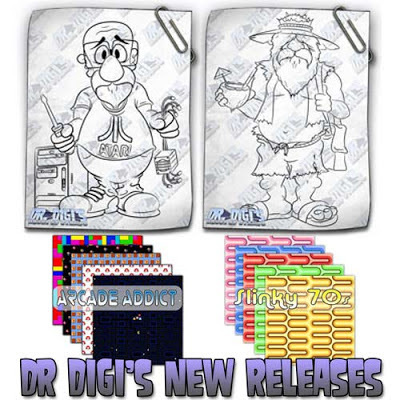 The Latest newsletter brings you another great batch of releases. computer whizz out there. Just dont ask him to fix your email. "Slinky 70s" A great retro guys background. Dr. Digi's House of Stamps' has done it again with the shapely Svetlana Queen of Uranus! 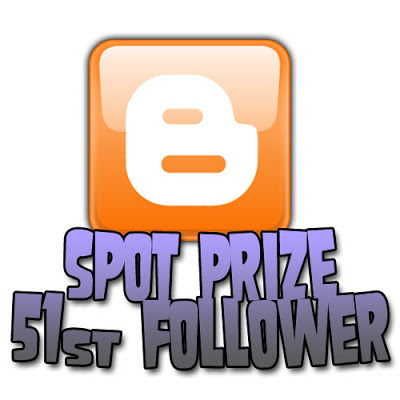 The Queen is on top of the world since winning the recent gun tournament firing against scores of her loyal subjects. Her father, the good King of Uranus, was on hand to direct the blindfolding of all those competing to ensure his daughter's win! Trish over at Just Inspirational challenge blog has fired up the BBQ for this great card. BBQ Bill certainly knows his way round a sausage. I think most of us have been in a DIY store looking at tins of paint or looking at paint strips just for that perfect shade. However hard I try though I never quite manage to get the shade that it says on the tin. Of course whilst it is me who chooses the paint it's usually not me who puts it on the walls so guess who gets the blame for the colour not looking quite right? Anyway you can find Dunderton Decorators Ltd HERE, he's great for the decorators in your life or perfect for a new home card. few days left to make the most of your 25% off all Dr. Digi products. 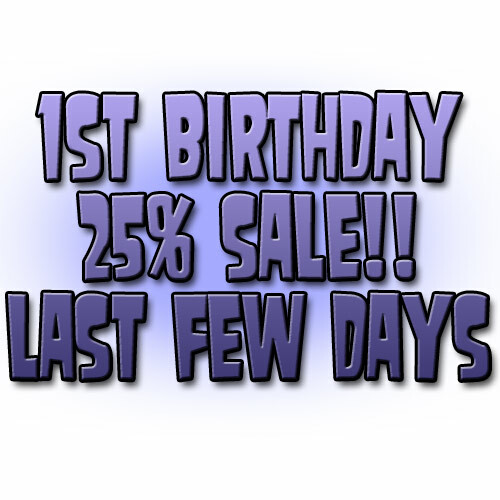 The discount code drd1st25 will run out on Sunday, so you better use it while you still can. Caz knows who to call when there's some DIY needing done. Sometimes there is a certain film or tv series that really captures the imagination. This can become an all consuming passion in which the hooked partake in realistic fully costumed renditions of favourite scenes. Svetlana is no exception. Here we manage to capture a glimpse of her just prior to transporting herself to such an event. Her front room (or 'parlour' as she pronounces it in her heavy LiLithuanian accent) is quite the shrine to the popular interstellar travel series that is Star Trek, circa 1968 - The Original Series. Complete with glittery floor covering (a DIY attempt to recreate the Starship Enterprise) and a blow-up globe, Svetlana feels right at home. Svetlana Queen of Uranus can be transported to your own hard drive for the token gesture of two English Pounds. Her occassional side table is also available for 50p, and if you too desire the Bloomin' 70's wallpaper, this can also grace your creations for £1 - be sure to check the multi buy discounts though on the papers! 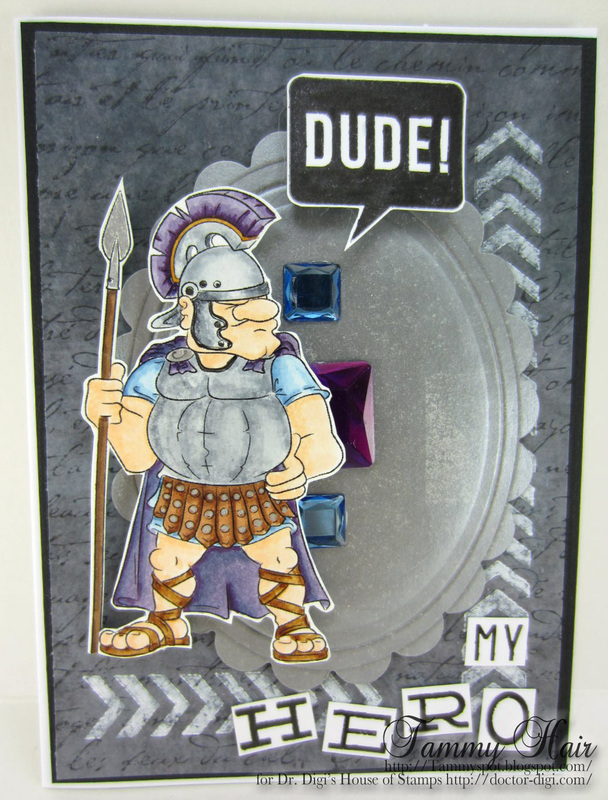 Dr Digi's House of Stamps is introducing another great way to save money on some great designs. 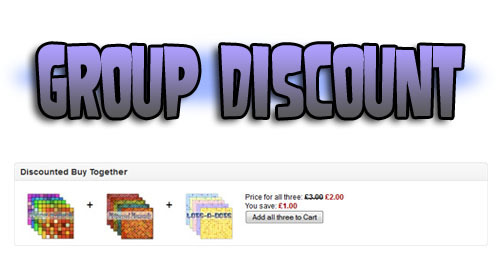 "Group Discount" is a new option that will be available on a changing range of products. to find the discount. Buy 3 papers and get £1 off. That's works out at 3 for the price of 2!! 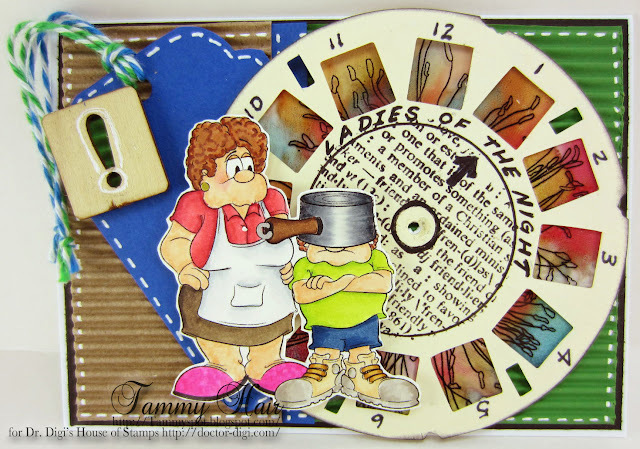 Dr. Digi's House of Stamps' frustrated Kid Pan Head, is learning the hard way that mothers will be mothers when they catch their little boy red handed with his fist in the cookie jar or looking at daddy's X-rated Viewmaster reels! Tsk, tsk, tsk! 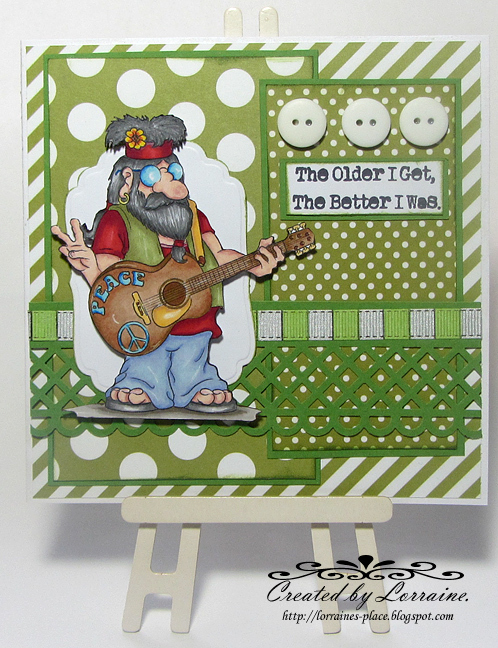 Shelly's used Anglin' Andy on this fab card for Just Inspirational challenge blog. 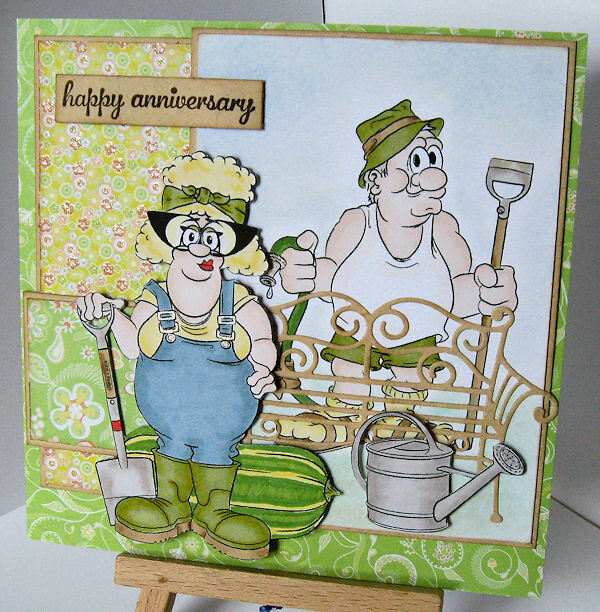 Every good man has a woman behind him, in the garden though the rules are reversed, every good woman needs a slave behind her, hosing the plants, pulling the weeds, digging for victory in the local village fete largest marrow competition. All women, of course, are more than capable of doing this but if their partner will insist on wearing a tatty old vest out in the garden then you make sure you get the limelight! Judith CE is our spot prize winner for being our 51st follower! PS. if you can contact us with your email Judith we'll sort out your prize. 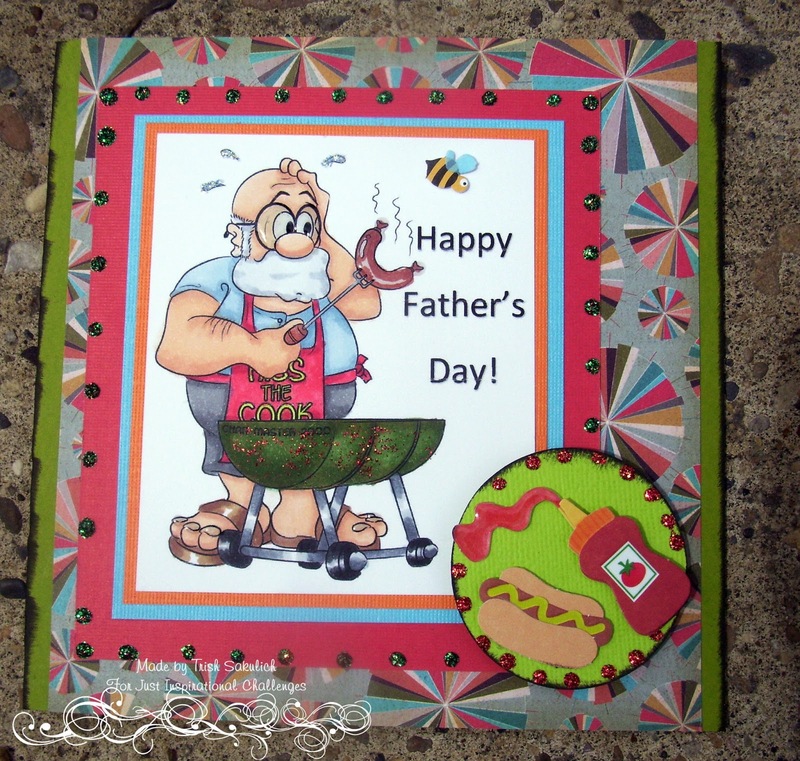 This is the card I'm going to send my Dad for Fathers Day (which is this coming Sunday in case you'd forgotten). Now, I know he has a sense of humour but I'm not sure if I'm pushing my luck a bit too much here as my Dad doesn't quite look like the image on the card; yes he is balding but he's not quite at the Santa look just yet. But I do know he likes his tea. Feet Up and A Cuppa are available to buy right now so you too can insult your Dad! Plus authentic Bloomin' 70's wallpaper adds the perfect touch - available in various cringy colours! checkout when prompted, to get your discount. Well... What you waiting for? The amazing Dr. Digi's House of Stamps has done it again with the debonair Gluteus Maximus, all decked out for his first day of work! Believe it or not, he's been hired to stand around and look pretty at a new casino that is celebrating its grand opening today! Let's hope his cape stays put since there is no back to his costume! 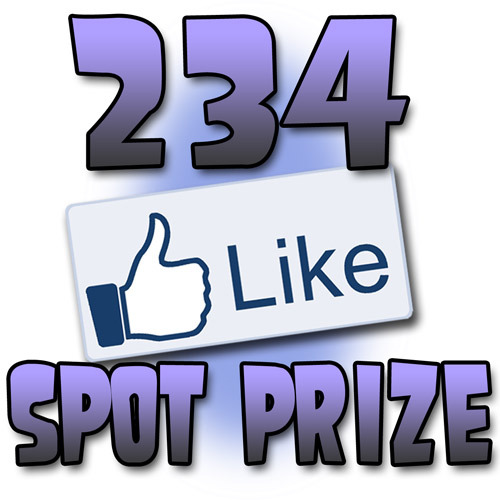 for being our 234th Facebook like! Congratulations Teresa. 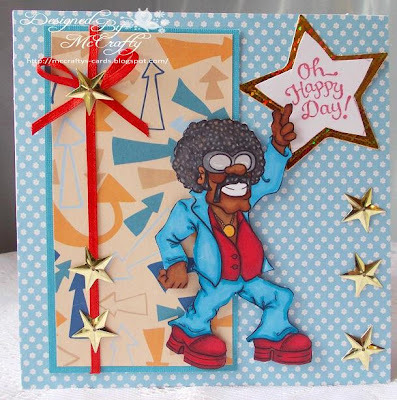 Chrimbo Crackers a great little challenge blog run by our very own Ruth "tip top" Cunliffe. 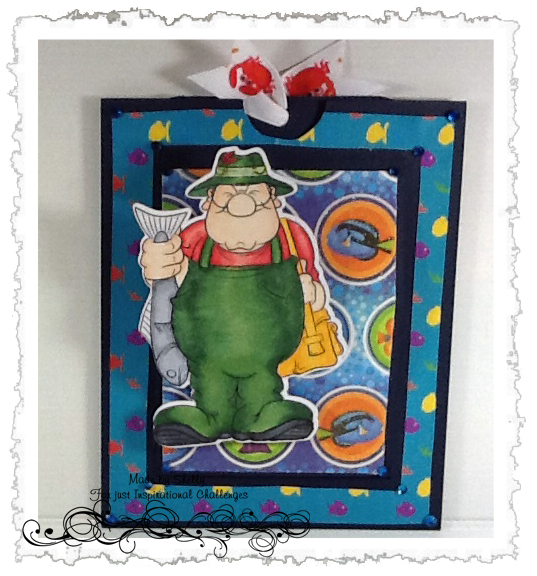 cautionary card for all you potential snowmen makers out there... You've been warned.. If you pop down to your local Dr Digi's Disco next Saturday night, you will find Steven there dancing the night away, Hes been going every Saturday night since 1972 and hes been wearing the same outfit too,he is a real star, as soon as Night Fever plays everyone clears the dance floor to watch Steven strutting his stuff. 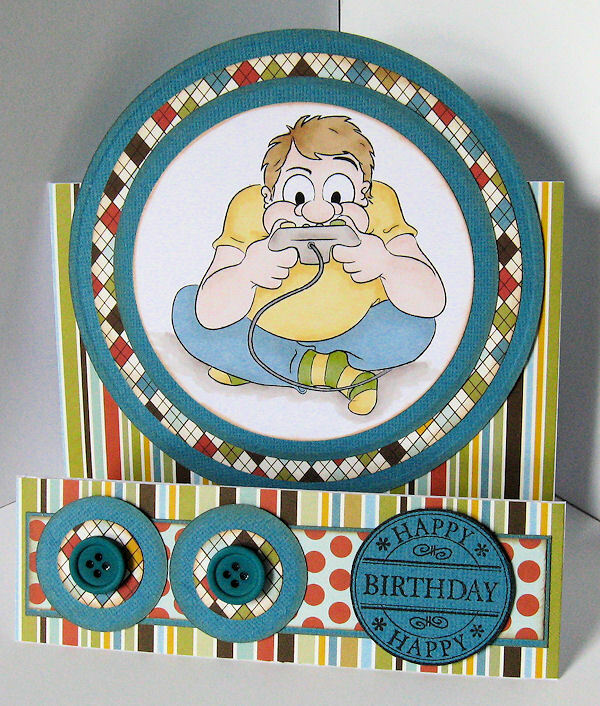 the rest of the time you can find Saturday Night Steven in the store Doctor Digi's House of Stamps. Corporal Clegg has a special message to give. Actually, its more of an order than a message and he is rather insistent that you have the best of the best of the best Birthday, SIR! And you're not going to argue with him, are you?! Give Corporal Clegg a home - he can be yours for only £1! 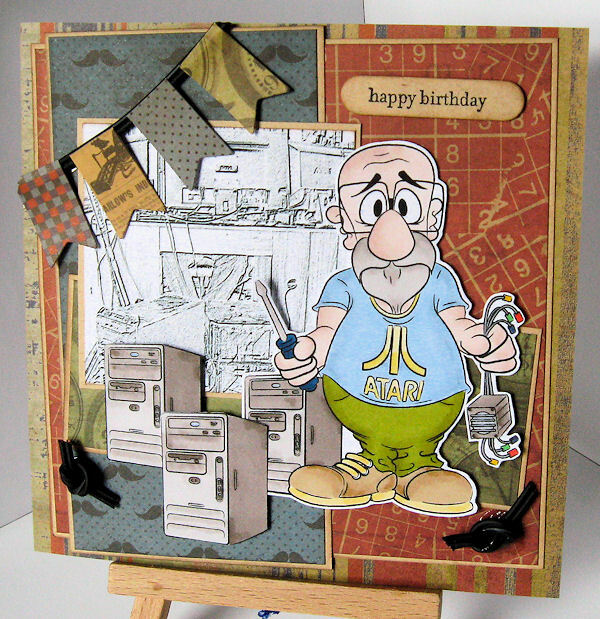 Whether you are a sailor, a pirate, or a land lover, you've gotta feel sorry for poor old Peg-leg-Pete from Dr. Digi's House of Stamps! 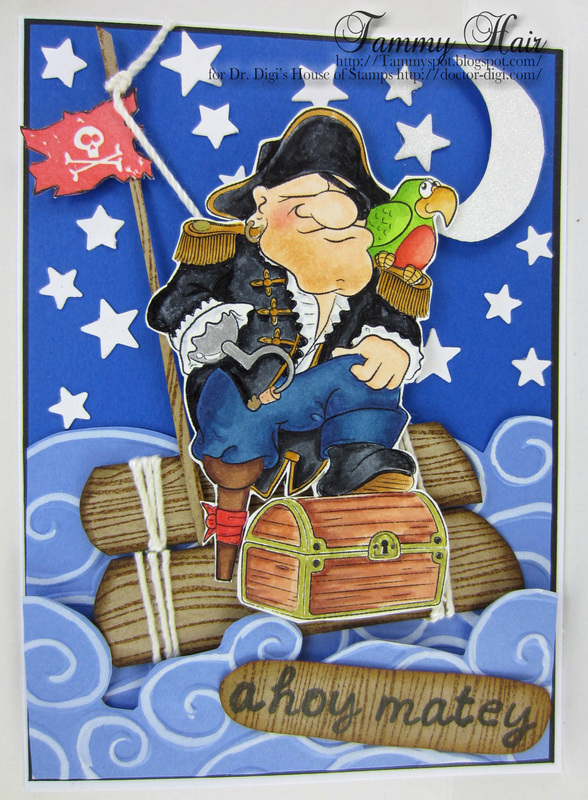 He's sailed all seven seas and he's been in many battles but now we see him floating down the river with a chest full of gold to give to someone, anyone willing to take the irritating squawking parrot off his shoulder so he can get some rest!